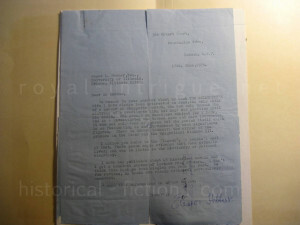 Just days after the announcement that confirmed Richard III’s remains were found, I received this correspondence (purchased from a document seller on eBay) between Eleanor Hibbert (Jean Plaidy, Victoria Holt, Philippa Carr, Eleanor Burford, Elbur Ford, Kathleen Kellow, Ellalice Tate, Anna Percival) and a reader from the University of Illinois English Department on Jane Shore, and along with her a mention of “the enigmatical Richard III”. This prompted me to compare my 1950 edition of The Goldsmith’s Wife with my 1979 edition, in which an Author’s Note had been added. Did this inquiry have anything to do with the curious addition to later printings? 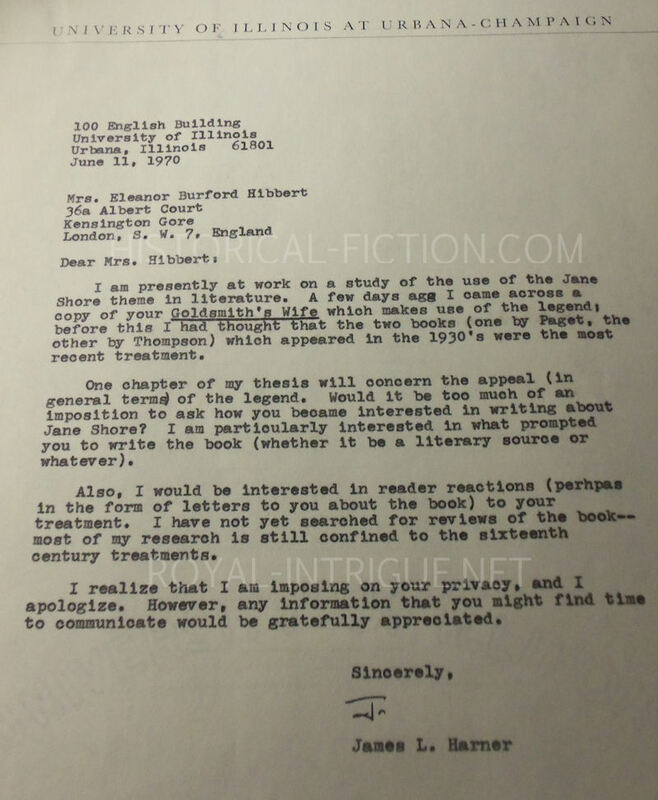 Re-reading the Author’s Note, it does not seem as though she had added any further thoughts relating to Mr. Harner’s questioning, though you can read it at the end of this post. It does, however, have much to do with Shakespeare’s version of Richard III, which is so much in the news right now. 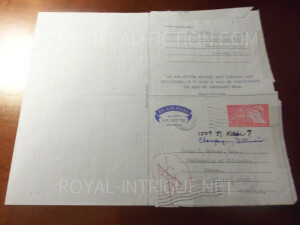 The letter from Hibbert is typed on a thin pre-folded page that is made to seal and mail, and has a stamp with Queen Elizabeth II’s image and “Ninepence Postage”. There is one inserted word in ink and several places where a letter or part of a word were erased and typed over. 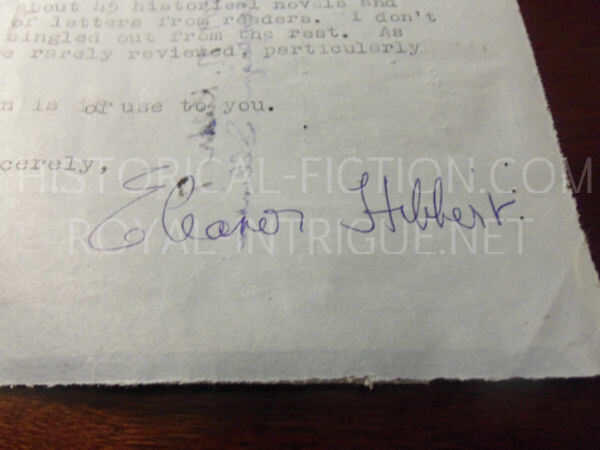 I think this shows that while Hibbert was a perfectionist with her writing, she was more lax (though not sloppy or lazy) on personal correspondence, most likely due to the time restraints from her writing career. 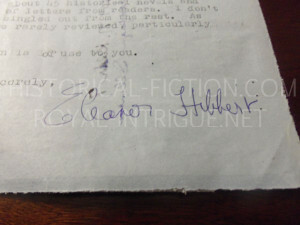 It is said that she answered all fan mail personally and did not employ a secretary. The address, Hibbert’s penthouse opposite Hyde Park, is at Albert Court, Kensington Gore. 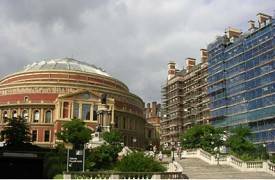 Having never been to England, I am only able to visualize via maps and images online, but it looks to have been a building next to the Royal Albert Hall. 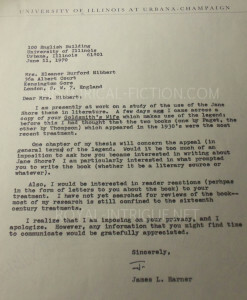 I am very surprised by Hibbert’s final words: “As for reviews, my books are rarely reviewed, particularly nowadays.” However, reviews in 1970 (at the time of this letter) were in the form of newspapers, periodicals and probably fan letters. Had she lived to see the age of the Internet, she would find generations of readers who still adore her and newly made fans every day, and a plethora of reviews. I hope you enjoy this little glimpse into the author’s life as much as I have! I am presently at work on a study of the use of the Jane Shore theme in literature. 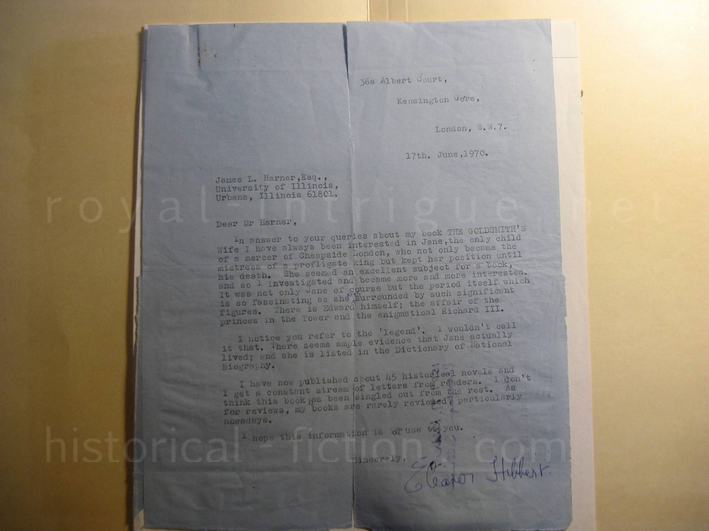 A few days ago I came across a copy of your Goldsmith’s Wife which makes use of the legend; before this I had thought that the two books (one by Paget, the other by Thompson) which appeared in the 1930’s were the most recent treatment. One chapter of my thesis will concern the appeal (in general terms) of the legend. Would it be too much of an imposition to ask how you became interested in writing about Jane Shore? I am particularly interested in what prompted you to write the book (whether it be a literacy source or whatever). Also, I would be interested in reader reactions (perhaps in the form of letters to you about the book) to your treatment. I have not yet searched for reviews of the book—most of my research is still confined to the sixteenth century treatments. I realize that I am imposing on your privacy, and I apologize. However, any information that you might find time to communicate would be gratefully appreciated. 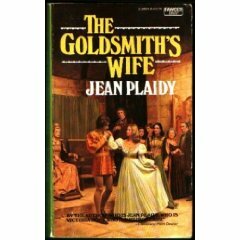 In answer to your queries about my book THE GOLDSMITH’S Wife I have always been interested in Jane, the only child of a mercer of Cheapside London, who not only became the mistress of a profligate king but kept her position until his death. She seemed an excellent subject for a book, and so I investigated and became more and more interested. It was not only Jane of course but the period itself which is so fascinating as she was surrounded by such significant figures. There is Edward himself; the affair of the princes in the Tower and the enigmatical Richard III. I notice you refer to the ‘legend’. I wouldn’t call it that. There seems ample evidence that Jane actually lived; and she is listed in the Dictionary of National Biography. I have now published about 45 historical novels and I get a constant stream of letters from readers. I don’t think this book has been singled out from the rest. As for reviews, my books are rarely reviewed, particularly nowadays. I really enjoyed this book very much and now count it as one of my favorite Plaidy novels.